Following on from my last exhibit in 2010 with the RHS, I am working up to another exhibit. The question is, will I get the required number of pictures done in time and will I be offered a place in the London exhibition? Last time I painted a series of Magnolia x soulangeana pictures in watercolour. 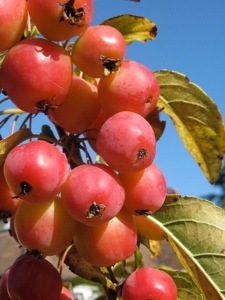 This time I am painting a series of Crab apple pictures in coloured pencil. Each of them will be a different crab apple. I have done a certain amount of preparatory work. I have sketches of each of the apples and during the short flowering time last year I did sketches of each of this chosen plants in flower. I had my work cut out doing the sketches in time. So far during the winter I have decided roughly what needs to be included in each picture and have started a couple of the series using the sketches I already have of the apples. I intend to keep people up to date with what I am doing. I foresee the first significant problem arriving in April during the short blossom time as I have decided to do detailed drawings from dissections of each of the plant. Flowering lasts about two weeks! Follow my blog to see how the process develops.